Subscribe to this channel to learn best practices and emerging trends in a variety of topics including exploring and visualizing data, building dashboards, sharing, importing, and embedding your company's data. The world of data is changing at breakneck speed. Costs are dropping, speed is increasing, and centralization is getting easier. But getting more value from your data isn’t always easy. We’ll talk about the key trends in analytics and how to prepare your organization for this new world. Incorporate data into your product, and take advantage of word class databases and a modern data platform. And learn from companies that have been there. - How to incorporate data into your product, and take advantage of word class databases and a modern data platform. And hear from companies that have been there. - Learn how PDX improved their in house analytical solution and offered their pharmacies a premium level of service — granting them access to collaborate and share the data that they need. - Learn how Namely, a HR platform, was able to leverage modern technologies ---databases optimized for performance, ETL tools, BI platforms that offer customization and can scale — to build out a scalable go to market solution in 3 months. Have You Seen Your Data in Virtual Reality Yet? Looker is pushing the bounds of how people explore and share data. Imagine being able to walk through your data - now you can. Like all things with VR, it’s difficult to understand without seeing it yourself. Join our online live streaming demo of LookVR. When you don’t have a solution for data, you fall back on slow, suboptimal tactics for accessing data, denying business users and decision makers access to the most accurate, up to date, and relevant information. Learn how Talkdesk went from a chaotic world like the one above to being a company where people can easily explore data and quickly get a 360° view of every account. Using FiveTran and Looker, Talkdesk’s product manager was able to tie all their now-centralized data together to create a powerful and stable environment for data discovery. Watch to understand how to take control of your data and use it to drive results. Athenahealth is on a mission to ‘unbreak’ the US health care provider experience, and they are using data to do it. With a new Snowflake data warehouse and Looker data platform on top, data analysts at Athenahealth are delivering data to more people in their organization, and improving patient experience in the US healthcare system. Embedded analytics is not new, but the technology for integrating charts, reports, dashboards, and self-service exploration has evolved considerably in the past 5 years. Today, companies in every industry are strengthening relations with customers and suppliers by productizing their data to make it accessible where people need it, when people need it. Infectious Media runs on data. But, as an ad-tech company that records hundreds of thousands of web events per second, they have to deal with data at a scale not seen by most companies. You can not make decisions with data when people need to write manual SQL only for queries take 10-20 minutes to return. Infectious Media made the switch to Google BigQuery and Looker and now every member of every team can get the data they need in seconds. By analyzing a cohort, you can discern patterns across the customer journey and answer any number of questions — which marketing channels delivered the highest-value customers? At what point do users stop engaging? Where is fraud coming from and how do we shut it down? In this webinar, Looker and Avant discuss the value of cohort analysis, tips and tricks to get the most out of it and specific examples of cohort analyses done by Avant. If your company is like many others, you have embraced Salesforce.com (SFDC) as your CRM tool. You can’t live without it. All your lead and customer information, in one handy place. But...How does your current pipeline compare to this time last year? Last qtr? Which of your field reps are demonstrating the greatest success, and in what areas? You have become painfully aware of the limitations of one of your most important data sources. 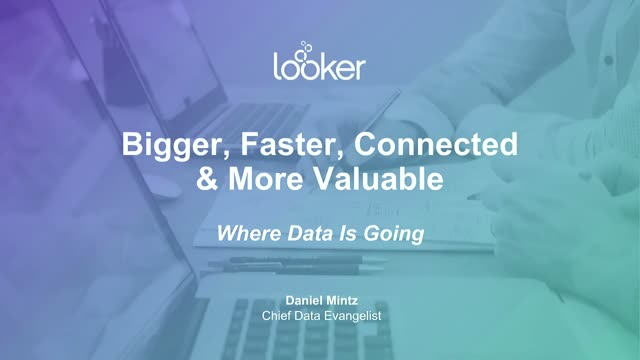 Rich Taylor, Looker’s Senior Director of Operations & Marketing (and a long time SFDC user), chats with Kevin Marr, Senior Looker Data Analyst discussing the ways we, as well as our customers, use Looker to get the most out of data captured by SFDC. - Snapshots of pipeline: Develop a clear understanding of the business, trends over time, and pipeline vs. target analysis. - Conversion Rates: view them at each step of the sales funnel, and compare them across teams, individuals, and timeframes. - Identifying trends: Project the probability of pipeline closing over time. - Rep Specific Dashboards: Compare a single rep to team and the entire sales org on multiple factors, including customer health for improved and proactive customer retention.